Every face that we encounter represents someone’s history and background. It reflects the characteristics of that person’s biological parents. It reminds us that this individual is someone’s brother or sister, son or daughter, mother or father. A face may tell us if this person has had a hard day or a rough life, or what he or she is feeling. It may communicate the person’s age, health and even who he or she does or does not spend time with. As Moses came down from Mount Sinai after meeting with the Lord, it is recorded that his face shone, so much that Aaron and the children of Israel were afraid (Exodus 34:30). Pastor Richard Wurmbrand, who endured years of prison and solitary confinement under the Communist regime in Romania, emerged from his sentence not with a countenance reflecting despair or hopelessness, but with joy. His face shone, because in the dark, cold, lonely and crude cells, he met with the Lord. God was and still is present in the most hostile environments worldwide. He is everywhere, as the psalmist penned, “If I ascend into heaven, You are there; if I make my bed in hell, behold, You are there. Indeed, the darkness shall not hide from You” (Psalm 139:8,12a). Prison was not the end for Pastor Wurmbrand. In the “hell” of his prison cell, he met with God, as have many persecuted Christians throughout church history. In the Soviet Union, Aida Skripnikova was imprisoned four times for her witness. 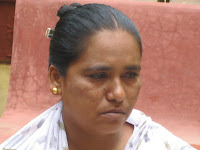 She entered prison a young, beautiful woman, but left with a face and body reflecting the harsh conditions she endured. Yet as she left prison, her face shone. 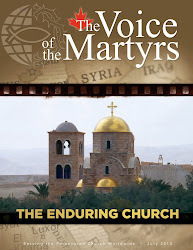 The Voice of the Martyrs presents the “most meaningful surface” of the persecuted Body of Christ — their faces, representing a human life with a story, a family … someone’s brother, sister, son, daughter, mother or father … experiences of heartache and victory, mourning and joy. As you read their stories, spend extra time looking at their faces. Cut out or photocopy the photographs in our newsletter and place them on your refrigerator or in your Bible, bringing their faces into your prayers. As you lift up requests for that person and his or her country, ask that despite opposition and persecution he or she will remain close to the Lord, leaving His presence with a shining face so that others — even their persecutors — will see and come to know Christ. For other articles and devotions about praying for the persecuted Church, please visit our website. in Orissa, India. You can watch her testimony on our multimedia site. About 10,000 Christians remain homeless four years after Hindu militants destroyed over 5,000 homes while plundering and setting hundreds of villages ablaze in Orissa State (now called Odisha State), India, reports Asia News. Violence broke out in 2008 in Orissa following the assassination of the leader of a Hindu ultranationalist group. Although a Marxist group claimed responsibility, Hindu militants blamed Christians and launched widespread attacks. During the violence, tens of thousands of Christians fled their homes, dozens were killed, and hundreds were injured. Today, many families that were affected by the violence continue to live in ghettos, and Christians who refuse to convert to Hinduism are often victims of social, economic and political discrimination. According to a fact-finding visit by a group of journalists, activists and writers, there has been no justice for victims and compensation for lost homes and churches has been inadequate or non-existent. 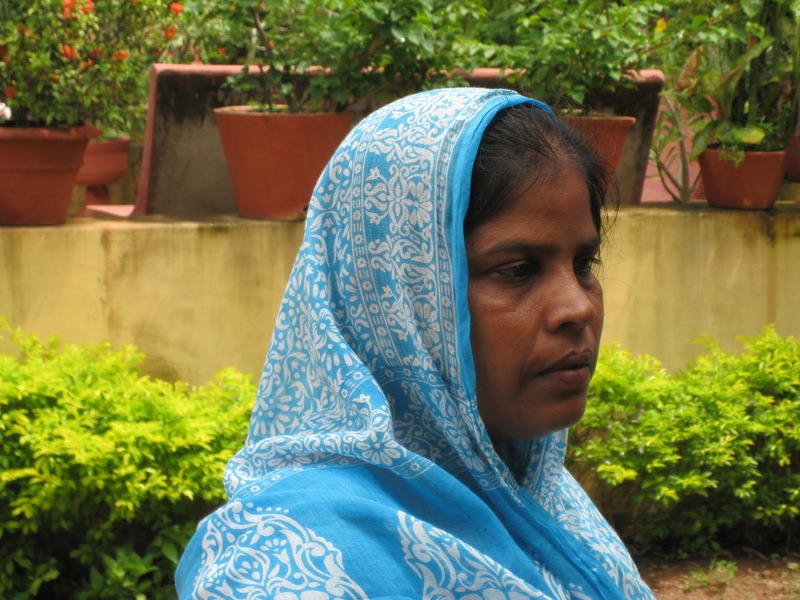 Four years later, The Voice of the Martyrs continues to help Christians in Orissa rebuild their lives. We work with local partners to provide skills training to believers who have received little to no help, enabling them find meaningful work and provide for their families and others in need. Those who receive skills training also become potential candidates for a microloan program. We are also coming alongside the local church to provide discipleship training to church leaders, equipping them to be godly shepherds of their congregations in the midst of hostility and opposition. Finally, we care for the children who lost one or both parents in the violence by providing them a safe home, education, clothing, food, and medical attention. To join us in remembering our persecuted family in Orissa through this practical support, please consider making a donation. We also encourage you to pray for believers in Orissa, and tell others about their suffering. For specific prayer requests for suffering believers in Orissa, please read our Persecution & Prayer Alert. Please also share these prayer requests for Christians in Orissa in your church’s bulletin or share this blog post on Twitter or Facebook. Thank you for remembering our persecuted family in Orissa! Herod Antipas smiled and nodded with approval. His step-daughter Salome* swayed and twirled in front of him and his birthday-party guests, her graceful figure filling them with longing. Her performance done, Herod and the guests applauded. What a dance! Inflamed by his senses and the mood of the moment, Herod cried, "Ask me what you want--up to half my kingdom--and it is yours!" And he swore a great oath to confirm his promise. As a Tetrarch (ruler of one quarter of a Roman province) Herod was more than able to provide a handsome gift even by first century standards. Would Salome ask for a jeweled necklace? A dowry? A house? Herod and the guests waited to hear her request. The girl herself hesitated. Uncertain what to ask for, she whispered with her mother. Down in the dungeons of Herod's fortress (named Machaerus) a man's fate was about to be decided. John the Baptizer was under lock and key in one of those gloomy holds. The cause was this: he had rebuked Herod for stealing another man's wife – Herodias. This woman had been married to Herod's quiet half-brother, Phillip. Herodias was furious, and convinced Herod to arrest John. Herod was only too willing; he was suspicious of the large crowds John attracted. However, once Herod got John in his lockup, he talked with him and found he liked the guy. He didn't understand what John was saying about holiness and salvation, but it seemed to be something he should hear. Instead of executing John, he gave him visitation privileges. Execution would be a bad idea, anyway: John had a lot of followers; why make them mad and risk rebellion? Salome approached Herod. Evidently she had made up her mind. The guests and the king turned to hear what she would ask. "Give me now the head of John the Baptizer on a platter!" said the girl. Even that reckless, hardened lot must have drawn sharp breaths at the gruesome request. How quickly the indulgent mood melted. Did Herod's face change? Here was an awkward demand! Looking around at his guests, he saw only one thing. If he was to save face, he must fulfill his promise. He ordered the execution. 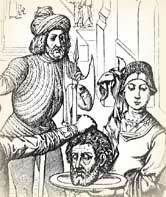 According to a long-standing tradition, John was beheaded on this day, August 29, probably around the year A.D. 28. * The name Salome is not biblical, but is given by tradition. Excerpted from an article by Eric Foley, CEO of VOM Canada’s sister mission, Seoul USA. must develop and grow through the Holy Spirit. As I travel around the world speaking about the North Korean underground church, one of the things I observe is that Christians in the West invariably love to hear stories about how persecuted Christians produce jaw-dropping, heart-warming forgiveness with the same frequency and ease with which McDonald’s produces french fries. The one small problem with this is that it’s not true. In my own experience, persecuted Christians struggle with unforgiveness at least as much as Christians in the West do. They may even struggle with unforgiveness more than we do, given the suffering their families, villages, and churches regularly experience. Persecuted Christians are sometimes some of the least forgiving and most bitter saints I meet. When we assume that forgiveness somehow flows spontaneously in a persecuted setting, we overlook the reality that forgiveness is described in Scripture as a spiritual discipline, not a miracle. It is learned, in other words, not latent. We learn how to extend forgiveness to those who commit big sins against us by first extending forgiveness to those who commit little sins against us. And when we fail to see the connection between extending little forgivenesses and extending big forgivenesses, we hyperspiritualize persecuted Christians, letting ourselves off the hook from growing in the grace of forgiveness and ignoring the reality that it doesn’t matter where you are a Christian; God is going to seek to grow you daily in the Work of Mercy of forgiving and reconciling. In order to ensure that we grow in our practice of forgiveness each day, Jesus inserts into the Lord’s Prayer a daily petition that God’s forgiveness toward us be shaped by our forgiveness toward others. “Forgive me today in the same way I am forgiving others today, Lord.” That is humbling and stretching no matter in what nation God calls you to be his disciple. It is not an ounce easier in Nigeria than in North Dakota. Yes, beautiful, breathtaking forgiveness does happen among persecuted Christians. But it happens among those who have daily kept their hearts tender before the Lord through far less breathtaking, far more mundane acts of forgiveness preceding the hurt. The most moving stories of forgiveness in places like North Korea and Pakistan and Eritrea are not ones where a persecuted Christian spontaneously extends forgiveness to those who harmed his family. The most moving stories are the ones where a persecuted Christian prepared for the major forgiveness he would need to offer by working daily through the mundane morass of underground church conflicts, fights with his wife, and spats at work with co-workers. The miracle, in other words, is not the spontaneous extension of forgiveness but the hard-won battle quietly waged daily by the Holy Spirit to keep each of us from slipping into the sludge of bitterness, not at the hands of our worst enemies but rather our regular and closest companions. Examine your own heart. Are you allowing the Spirit to work forgiveness in your life and relationships? How might you grow in showing forgiveness, mirroring the forgiveness Christ first showed to you? 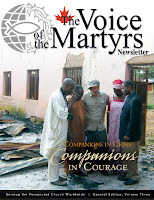 Look for the September issue of The Voice of the Martyrs newsletter in your mailbox this week! Companions in crisis, companions in courage: Discover how you can be a companion to our persecuted brothers and sisters around the world, as exemplified by the disciple John on the island of Patmos. Companions through God’s Word: Would you travel over 1,000 km just to get a Bible? Read about the hunger our brothers and sisters have for God’s Word and learn how you can join with VOM in helping them receive Bibles. Companions through ministry tools: VOM founder Richard Wurmbrand wrote about the necessity of providing ministry tools to the Underground Church. Learn how VOM equips persecuted believers with motorcycles, horses, and other tools to allow them to more effectively reach communities with God’s love. 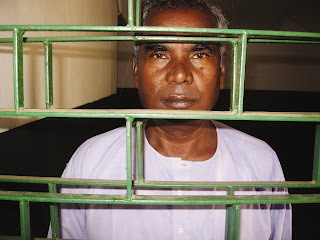 Companions through medical help: Read how VOM’s Medical Fund helped “Samuel,” a believer from a Southeast Asian country who required medical care after spending seven years in prison for his faith. 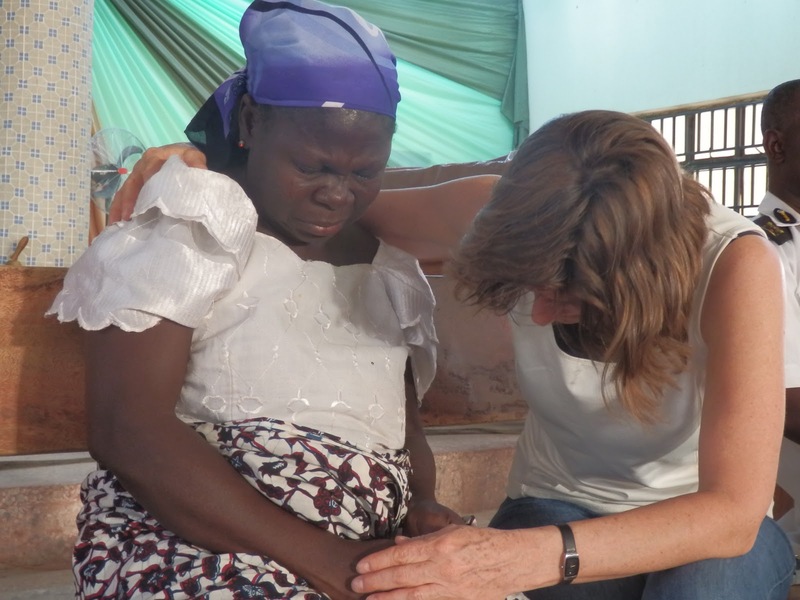 Companions through encouragement: Learn how you can encourage Christians like Pastor Johnson, whose wife was killed by militants in Nigeria, and Bhagaila, who was beaten by her husband in Nepal when he learned she had converted to Christianity. Hear me, O God; never in the whole of my lifetime have I spoken to you. But just now I feel like sending you my greetings. You know from childhood on they’ve always told me you are not. I, like a fool, believed them. I’ve never contemplated your creation. And yet, tonight, gazing up out of my shell hole, I marvelled at the shimmering stars above me and suddenly knew the cruelty of the lie. Will you, my God, reach your hand out to me, I wonder? But I will tell you and you will understand. Still, will you let me enter now, when I do come? Why, I am crying! O God, my Lord, you see what happens to me. Tonight my eyes were opened. Farewell, my God. I’m going and not likely to come back. Strange, is it not? But death I fear no longer. Martyrs teach us about God’s faithfulness, his peace, his love, and his protection. However, the stories of martyrs are not only about the martyrs themselves, but also about their enemies. Those who converted from Communism to Christianity tell another side of the story. They reveal God’s patience, his grace, his willingness to forgive even the worst sinner who asks for his forgiveness. Alexander’s poem gives voice to the plea of any repentant sinner whose “eyes are opened” to the truth. His story reminds us that we serve a loving God who longs for us to realize who Jesus is and to come to him for salvation. This is the mighty message of the martyrs. Is it yours? might be granted clemency. She was not. Pakistani police have taken 11-year-old Rimsha Masih into custody after a mob accused her of desecrating pages with verses from the Qur'an. 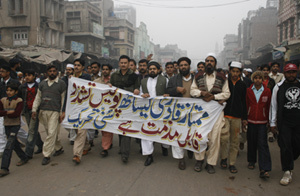 The mob demanded the Christian girl's arrest and threatened to burn down Christian homes outside the capital Islamabad. More than 600 people have fled from the Christian neighbourhood and her parents have been taken into protective custody following threats. Officials said the girl could not properly answer police questions. It is thought that the girl has Down Syndrome. Pakistan's President Asif Ali Zardari has ordered an investigation into the arrest. The girl's plight is likely to reignite debate about growing religious intolerance in Muslim-majority Pakistan, where strict anti-blasphemy laws make defaming Islam or the Prophet Muhammad or desecrating the Qur'an a capital offence. Please pray for this young girl and her family. Pray for their protection and for her release, and pray for the Christian families who fled their homes. Pray that this case will shed further light on the problems of the current blasphemy laws and bring about change. Gus G. is an ordinary man who has shown extraordinary service to the persecuted Church. Originally from Saskatchewan, Gus and his wife spent several years as missionaries in northern Manitoba. They also ministered for three years in various native reservations. Today, Gus lives at a senior’s home in Alberta . In our May 2011 newsletter, we invited readers to sew parachutes that are used to drop Christian materials over guerrilla-controlled regions in Colombia. With the pattern VOM provided in hand, Gus began sewing. A year later, he has completed approximately 500 parachutes! Self-taught and 86 years old, Gus received a more efficient sewing machine, which has aided in his work. 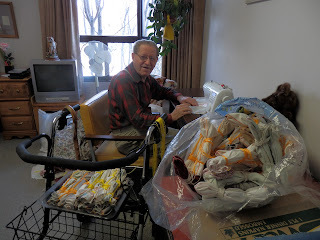 He continues making parachutes as well as special pouches to hold shortwave radios pre-tuned to Christian stations. So why does Gus spend so much time and effort sewing? He told VOM’s Ingrid Hajen that it is a way he serves the Lord and that it keeps his mind and hands busy. He prays that God will use his efforts for His glory. We are thankful for and humbled by the many Christians across Canada who, like Gus, use their time and talents to glorify God by serving Him. For Gus, service comes by sewing. Others show extraordinary service by ordinary things like writing letters, organizing events, or interceding in prayer for persecuted Christians. Through ordinary activities, the Lord is doing marvelous things (Psalm 98:1)! How can the extraordinary love that you have experienced through Christ be expressed through extraordinary service to our persecuted family? Join Gus in making a difference for Christ in Colombia! For sewing instructions and a pattern to follow, click here. One of the great privileges I’ve had since getting involved with VOM is meeting with my brothers and sisters in Christ as I’ve travelled to countries hostile to the gospel and as I’ve spoken in churches across Canada. While I knew what the Bible said about Christ’s followers being a part of the family of God, my journeys over the past dozen years have burned that truth deep into my heart. God is our Father and, as a result, His children are our brothers and sisters and we are commanded to love each other (1 John 4:21). Often we refer to those who are suffering for the cause of Christ as the “persecuted Church,” but by doing that we sometimes unintentionally make a separation or distinction between those who live in countries like Canada and those who live in restricted nations. Regardless of what opposition for our faith we are going through, whether minor or severe, we are one Family and part of one Body, the Church. 1 Corinthians 12:26 tells us that when one part of the Body suffers, we all suffer. One of the things I love most about being a father is seeing my children doing nice things for each other, especially if one of them is hurting. It brings me great joy! I believe our Heavenly Father feels the same way when we love our Christian family, and when we stand with our brothers and sisters in their time of need and pain. Heavenly Father, we thank you for the privilege of being Your adopted sons and daughters. Help us, we pray, to have unity with our brothers and sisters as one Family and to remember and care for each other. Teach us how to love one another and equip us, we pray, to suffer and rejoice together. Amen. Pray for churches throughout Tanzania. Believers in a church twice attacked by a violent mob continue to worship and share the gospel despite the danger. Members of an Assemblies of God church on Zanzibar Island, Tanzania, are continuing to meet for worship and outreach even though in May, a mob of 300 broke into the church and set musical instruments, chairs and the pulpit on fire. Just months before that, Muslims extremists threw a large homemade bomb into the church as 500 believers celebrated the New Year. The bomb did not detonate, but police said it could have killed everyone inside had it exploded. Please pray for this church. Praise God for the boldness of these believers! Please pray that they will not be hindered as they take the saving message of Christ to those who have not been reached in their community (Acts 28:31). Pray that God will thwart the efforts of those seeking to harm Christians or Christian property in this community. To post a prayer of support for these believers, please visit our Persecuted Church Prayer Wall. Join us at a VOM event this September to hear reports about the persecuted Church, learn how you can stand with those suffering, and fellowship with other believers in Canada. September 9, 2012 – 10:45 a.m.
For more information, phone Pastor Darrell Crain at 506-278-3262. September 9, 2012 – 11 a.m.
For more information, please phone 306-469-2258. September 15, 2012 – 6-8 p.m.
To learn more, phone Igor Chetyrin at 204-380-2516. September 22, 2012 – 9:30 a.m. - 4:30 p.m.
For more information, click here or phone our office at 1-888-298-6423. To download the bulletin insert, click here (PDF). 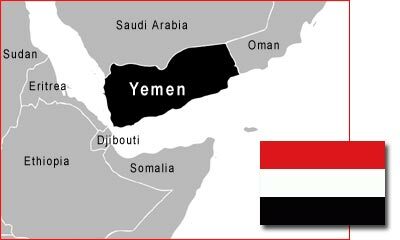 Yemen has had a turbulent history of wars and conquests. It is estimated that there are several thousand Christians throughout the country. Most of them are expatriates (Westerners, South and East Asians, Arabs) or refugees (mainly Ethiopian). There are a few converts from Islam. 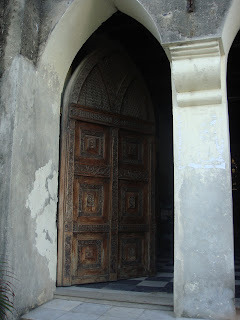 In Aden, there are a few churches, but in the north of the country no church buildings are allowed. The Yemeni Constitution declares that Islam is the state religion and that Shariah is the source of all legislation. As long as expatriates do not evangelize, the Yemeni government doesn’t intervene when they live out their faith, but Yemeni citizens are not allowed to convert to Christianity (or other religions). Converts from an Islamic background may face the death penalty if their new faith is discovered. Converts from Islam also encounter opposition from extremist groups, who threaten “apostates” with death if they do not revert to Islam. Proselytizing of Muslims is prohibited. Pray for greater freedom for believers to encourage others to follow Christ and to be agents of cultural transformation. Pray for the transformation of believers’ families, for it is from them that the worst persecution often comes. Pray that expatriate believers may maintain their spiritual growth amid discouragement, sickness, isolation and constant threats to their presence in the land. For reports and accompanying prayer requests on other countries hostile to the gospel, click here. “Why aren’t you willing to obey the government?”asked the lead officer. On August 1, a massive Islamic pogrom occurred on the outskirts of Cairo. 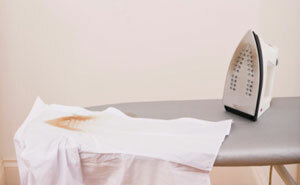 A Muslim took offence when a Coptic launderer accidentally singed his shirt. Rejecting the Copt's offer of compensation, the Muslim returned with a large mob and attacked his business. The Copt threw a Molotov cocktail, unintentionally hitting a young Muslim bystander. When the youth died a few days later, Islamic clerics incited the pogrom as collective punishment of the Copts. The violence and death threats forced virtually the entire local Christian community of approximately 120 families to flee. Pray the Lord will protect and provide for the families who have left the area. Pray the Lord will bring rest and peace to this nation. Pray the Lord will give His people the grace and strength to act as witnesses to the Gospel even when tested. In the past weeks, we have shared suggestions on how you can take the message of the persecuted to heart, and how you can share the message with your family and local church. Today, we are suggesting ways that you can share the message with your larger community. Grow your passion for the persecuted Church by joining VOM’s nationwide Volunteer Network. As a VOM volunteer, you will have the opportunity to share about our persecuted family with your local church or with area churches, schools, and in other settings. Each VOM volunteer is personally equipped and supported with ongoing training, resources, advice, and prayer. For more information visit our website or contact us. Write letters to government officials to share the reality of persecution today. Politicians at both provincial and federal levels should be kept informed of incidents of persecution which often take place in countries with economic and diplomatic links to Canada. They should also be encouraged to take action within their respective spheres of influence. Equally, foreign governments should be made aware that those who have been imprisoned for their faith have not been forgotten about. For details on how to write these letters, visit our letter writing site. Have other ideas you’d like to share? We’d love to hear from you. Please feel free to leave a comment below. Matthias was the alternate apostle. He was chosen to fill the vacancy among the Twelve created by Judas’s betrayal and abrupt departure (Acts 1:23-26). Based on the requirement that each of the candidates had to meet – a long association with Jesus as a disciple – it is almost certain that Matthias was one of the seventy evangelists the Lord sent out (Luke 10:1). He was a witness to the full scope of Jesus’ ministry. After his appointment in the first chapter of Acts, Matthias is not mentioned by name again in the New Testament. But neither are most of the original twelve disciples. Luke based his account in Acts of the development of the early church primarily on the ministry of Peter and then Paul. For Matthias’s role, we rely on the general participation by the Twelve in the affairs of the church in Jerusalem, and we also turn to the various accounts from tradition that include Matthias. As one of the apostles, he was under the public pressure of persecution that broke out when Saul and others decided they needed to stamp out the followers of Jesus. Matthias was one of those apostles whose missionary assignment took him north. Even Sebastopol (present day Sevastopol) on the northern side of the Black Sea is frequently mentioned as one of his destinations. 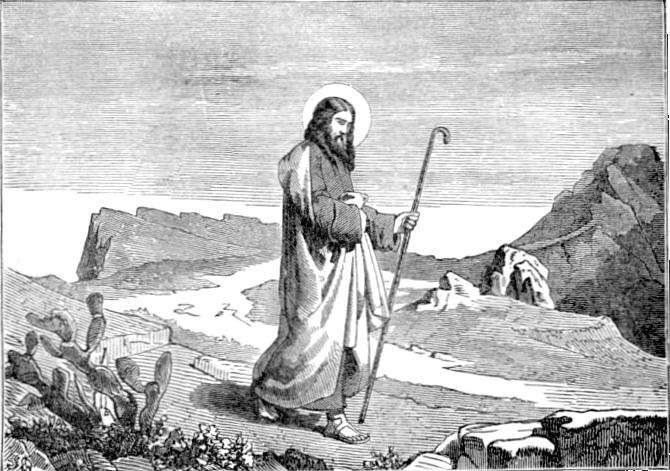 Eventually, Matthias appears to have made his way back to Jerusalem, where he was stoned to death. Some say he would not sacrifice to the god Jupiter. Others state he was hung on a cross, stoned and then beheaded with an ax for the blasphemy he had committed against God, Moses and the law. Excerpted from Foxe: Voices of the Martyrs, written by John Foxe and The Voice of the Martyrs. In Canada, you can order a copy of this book from our online catalogue. A church building was doused with gas and set on fire early in July in the province of Aceh in Indonesia, reports Asia News. Thankfully the entire building was not lost as congregants arrived to help extinguish the flames, although pews and several musical instruments were consumed by the fire. Since May, at least 20 house churches or prayer chapels have been closed by government officials in the province and violence is becoming a growing concern (for more, click here). Please pray that the Lord will protect those who love Him as well as their places of worship. Please pray that authorities in key positions in the province will receive the gospel message and come to faith in Jesus Christ. Pray that Christians in Aceh will be faithful to Christ despite the continuing opposition they face. 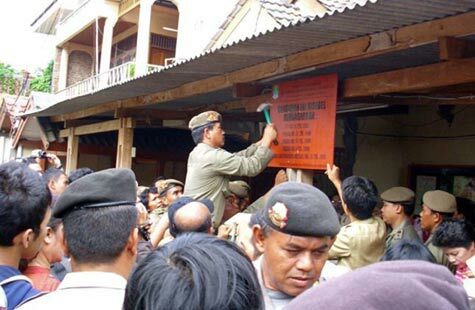 Click here for more on persecution in Indonesia. All they could find of him was his abandoned car. 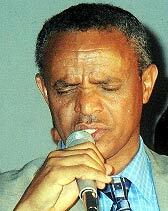 One ordinary Friday in March 2005, Kidane Weldou, a senior pastor of the unregistered Full Gospel Church in Eritrea, just ... disappeared. In the heart of Asmara, the country’s capital, he went missing – presumably snatched by authorities. For the rest of the weekend, officials gave no word to his family or church about what happened. His loved ones searched for him in vain, finding only his vehicle – empty, with no clues as to where, or why, he was taken. Kidane’s family and friends had good reason to suspect the government’s involvement in his disappearance. In the months before he was taken, other senior leaders of the Full Gospel Church were also apprehended. Several of these Christian leaders remain in prison to this day. It is assumed that Kidane suffered a similar fate – that somewhere in the east African country of Eritrea he is being held in detention. Pastor Kidane is married and has four daughters. For more than five years now they have waited, hoped, and prayed that, one day, their husband and father will be returned to them. Excerpted from Restricted Nations: Eritrea, a new resource by The Voice of the Martyrs. 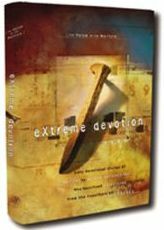 This book provides a brief overview of the persecution that Christians in Eritrea have endured in the past and gives a glimpse of the trials they face today. In Canada, you can order this book from our resource catalogue. In this video from the 1960s, VOM founder Richard Wurmbrand was interviewed about his involvement with the Underground Church. For other videos about the persecuted Church, visit our multimedia site. 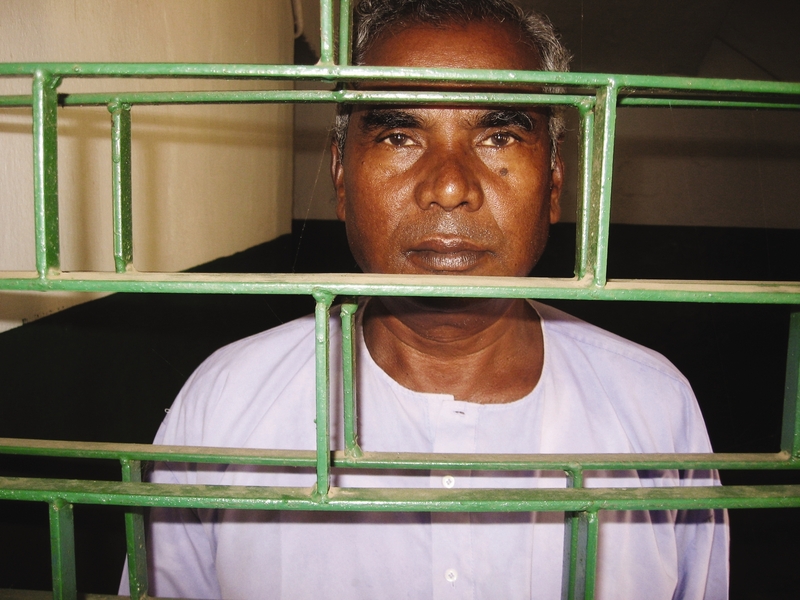 This was not the first time Milon G. had been threatened by angry crowds of Muslims. But such threats have not quenched his zeal to take the truth of God’s Word to his countrymen. We are confident of all this because of our great trust in God through Christ. It is not that we think we can do anything of lasting value by ourselves. Our only power and success come from God. He is the one who has enabled us to represent his new covenant. 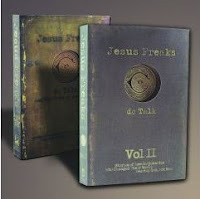 Excerpted from Jesus Freaks, a best-selling collection of worldwide testimonies targeting teens with the life-changing message of the persecuted Church. You can order a copy of this book from our online catalogue or by contacting our office. Please pray for Nima, Helma, and their parents. 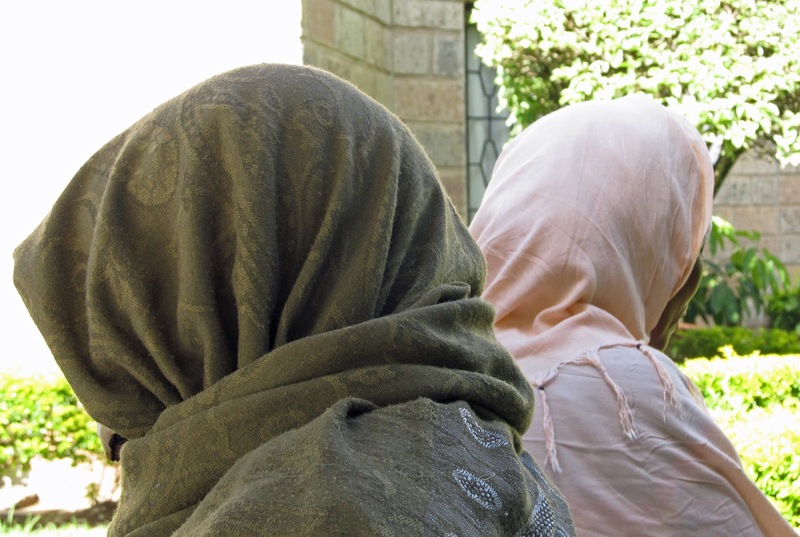 Two children in Iran are suffering severe hardship as they are forced to fend for themselves and work to support their parents who have been imprisoned for their faith, reports Mohabat News. Helma, 12, and Nima, 17, must earn money to survive and send half their income to help support their parents in prison. Christian converts Fariba Nazemian and Homayoun Shokouhi, the parents of the children, were arrested in Shiraz in February for their faith. Nima was also arrested when his parents were seized by security authorities. Nima and two other Christian converts were released on bail after more than a month in prison. However, Nima was not allowed to return to school upon his release because he had been in prison. The children have been denied visitation with their mother recently, whose health is said to be suffering as she is forced to work long hours in the sewing shop in the prison. The parents, along with three other Christian converts – Mojtaba Hosseini, Mohammad-Reza Partoei (Koroush) and Vahid Hakkani – have not yet been formally charged, but some judicial authorities have said they will be charged with attending house church meetings, evangelizing, propagating against the Islamic regime, and disturbing national security. Please pray that the Lord’s favour will be upon these children and that they will rely on their heavenly Father to see them through these trials. Pray that God will strengthen their mother. Please pray that all five imprisoned believers will soon be released. 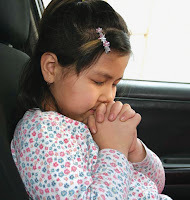 Pray that God will strengthen young believers to follow in the example that has been passed down to them by their parents and other Christian leaders (1 Corinthians 4:9-14, 16). To learn more about Iran's persecuted Church, click here. Before dawn on Sunday, September 13, 2009, a crowd of 400 government officials, police and hired ruffians launched an attack on the Linfen-Fushan Church in Shanxi, China. With no warning, members who were sleeping at the church construction site were mercilessly beaten, with more than 30 left in critical condition. Bulldozers razed the factory and church building, and the mob looted any valuables and smashed the remaining property. Following the brutal attack, the Fushan governing officials arrested more than 10 Linfen church leaders. One of them included head pastor Yang Rongli. On November 25, 2009, Yang Rongli was fined and sentenced to seven years in prison. As Yang Rongli suffers in prison, please consider writing her a letter of encouragement. When writing, never mention the name of the source of your information or the name of any organization such as VOM. It is not dangerous for a prisoner to receive letters from individuals, but if an organization is mentioned they may be accused of links with “foreign organizations” and receive harsher sentences. Also, please do not state anything negative about their government. To compose a letter in Yang Rongli’s own language, please visit www.PrisonerAlert.com. To learn more about letter writing, click here. We do not consider that sanctification is merely a personal matter; it is also a social vocation. Not only must I be glorified, but the social body must be glorified, by creating the kingdom of God on earth. In other words, a kingdom where justice, peace, and joy reign. We must fight for just laws and institutions, as the first Christians created an ideal social institution, the Church, which has this characteristic too. We long for a social justice which springs from love and is inspired by the wish to imitate God, who makes the sun to shine and the rain to fall on all alike. Jesus reproached whole towns for not being converted (Matthew 11:21-23); in other words, He expects conversion to be a social phenomenon, embracing large numbers of people. 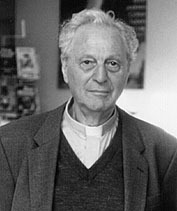 Excerpted from Richard Wurmbrand’s book, Christ on the Jewish Road. In Canada, you can order this book from our online catalogue or by contacting our office. by those opposed to Christianity. It is estimated that there are only some 30,000 Somali Christians, with most living outside the country. To be a Christian in Somalia is to live under constant threat. 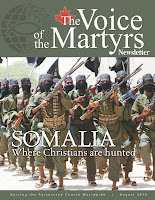 Certain groups in Somalia, such as the militant organisation Al-Shabaab, are committed to killing any Somali who abandons Islam to become a Christian. The threat to Somali Christians outside Somalia is still a reality, particularly in neighbouring Kenya, Djibouti, parts of Ethiopia and some other African countries. “John” was to be my companion and “taxi driver” during this trip to Kenya and he very quickly became a special friend. You could relax when you were with John, confident that he knew his way around. As he spoke about Somalia and the ongoing violence I was able to understand and identify with some of the things he said: I myself had grown up through the Troubles in Northern Ireland. But when he presented me with a copy of a fatwa that had been sent to him declaring that he was to be hunted down and killed because of his Christian faith and his involvement in Christian ministry, I was saddened and staggered at the blind hatred and brutality expressed in the text. John just smiled and said he had been threatened like this on many occasions. I discovered that he frequently had to move house and change the route he travels in and out of the city. I found out that he loves Somalia and the Somali people and that he longs to meet the right Christian girl, get married and start a family. Spending time with John opened my heart, it changed my attitude to Somalia and it helped me to see something of God’s love for Somali people. 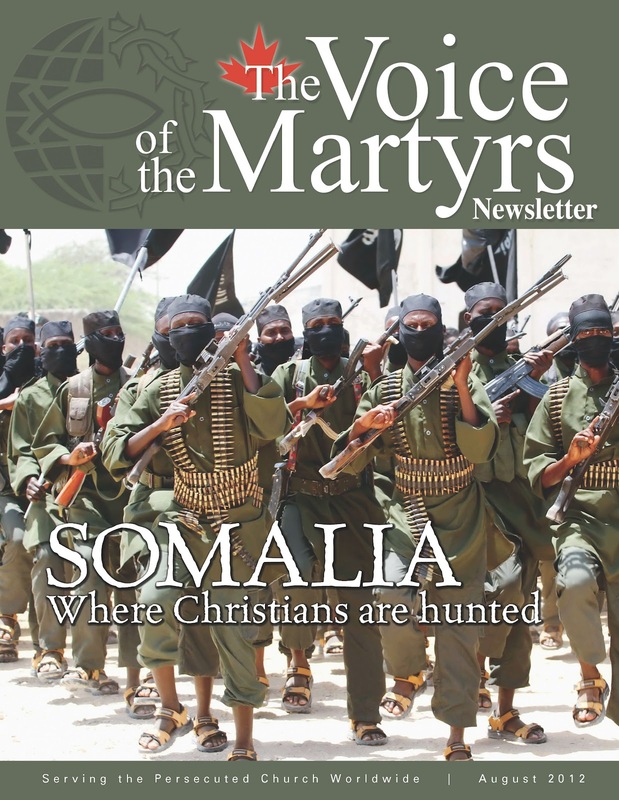 To learn more about God’s love for Somali people, contact our office to request a free copy of The Voice of the Martyrs August Newsletter. In July, Centre Street Church (CSC) in Calgary, Alberta, hosted a special service focussing on the persecuted Church. In the video below, you can watch an informative and moving message by CSC Pastor Ashwin Ramani entitled “Persecution Has a Face,” as well as view a presentation by VOM’s Greg Musselman. You can check if VOM is coming to an area near you by visiting our online events calendar. To request a VOM speaker to visit your church or group, fill out our speaker request form. Every day, more than 200 million Christians around the world suffer for their faith in Jesus Christ. Every year, Christians in more than 130 countries join together in prayer for our persecuted brothers and sisters through the International Day of Prayer for the Persecuted Church (IDOP). This year, IDOP falls on Sunday, November 4, 2012. To help you, your family, or your congregation join in this worldwide prayer movement, IDOP Canada prepares a kit with testimonies, videos, specific prayer points, and more. The following story is included with this year’s kit. For more testimonies like this and other helpful resources, keep your eyes on IDOP Canada’s website. The site will be updated in the coming weeks and months in preparation of IDOP. We look forward to joining with you in prayer this November. Pastor Zhang Rongliang has spent more than a fourth of his life in prison. He has been imprisoned five times, for a total of 19 years, over the span of his ministry as leader of one of China’s largest house church networks. 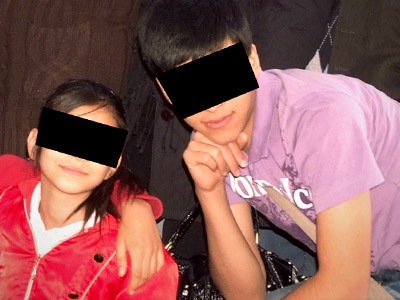 Before his most recent arrest in 2004, Pastor Zhang led a network estimated at 10 million believers. Yet the pastor refuses to learn the lesson Chinese authorities are trying to teach him. He continues his work as a Christian leader, sharing the gospel wherever he goes. 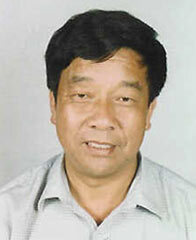 Pastor Zhang was released from his latest imprisonment on August 31, 2011, after more than seven years in prison. He endured torture and hard labour, all while suffering from diabetes and high blood pressure. 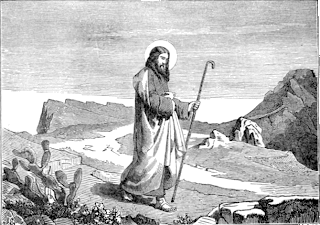 He was not permitted to have a Bible, and he was so ill that he had to be carried from place to place by two men. He didn’t think he would leave prison alive. His wife and two sons worried about him constantly, and many concerned Christians in Canada and around the world wrote letters to Pastor Zhang while in prison. Even while ill, Pastor Zhang was planting a church. “God called me to preach to the prisoners,” he said. During his imprisonment, almost all of the 5,000 prisoners had an opportunity to hear the gospel. 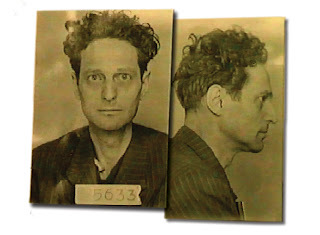 He was able to reach many men he would never have interacted with outside prison. Their questions were aimed at getting her to reveal the names of other Christians – those whom she had mothered in the faith and encouraged to be strong in the face of persecution. Now it was her turn to be strong, but she didn’t think she could bear another one of those interrogation sessions. The next session was played with a gentler, craftier approach. The interrogator was alone and smiling. “Dear woman, you are only thirty-six years old, with your whole life before you. Just give us the names of the traitors.” Sabina remained silent. We expect teenagers to go through it. We say it’s a rite of passage. Yet we never think it will continue to plague us as adults. Peer pressure. It’s that all-too-familiar feeling of “being bought” by someone or something whenever we are tempted to compromise our values. After the deal is done, we feel like suckers. Fools. We feel cheap, having betrayed our own self worth. However, Christ paid the ultimate price in order to win our affections. If everyone has a price, he named ours for us, once and for all. His purchase of blood makes us invaluable in his sight. You are already bought and paid for, so don’t sell yourself short. Remind yourself of that today. Boko Haram has been attacking churches, Christian areas and government targets in the north and south of Nigeria, killing around 1,000 people since 2009. They are known as Boko Haram, which means “Western education is forbidden” in the Hausa language. They prefer to be called Jama’atu Ahlis Sunna Lidda’awati wal-Jiha, which means, People Committed to the Propagation of the Prophet’s Teachings and Jihad. Boko Haram is believed to have links with al-Qaida, and to be splintered into several factions. Its stated aim is the imposition of Shariah (Islamic law) in Nigeria. Here are some of their teachings, in their own words, taken from videos in circulation on the internet. “Do not give any excuses when you are given an order to do a thing. You must carry out that order even if it will cost you your life. Haven’t you seen the faithful devotees that will be sent in a car with bombs for suicide bombing, and they willingly carry out the errand, the bomb goes off with him, and yet he is happy? You should be like that… that is how a faithful should be. 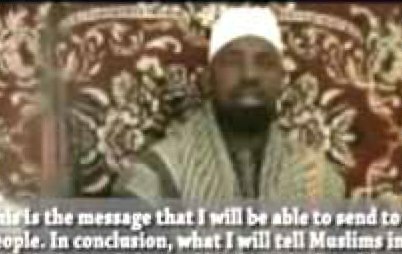 “For me now I proclaim that Nigeria as a nation must be governed by Shariah, and it must come to pass.” – Mohammed Yusuf. Founded Boko Haram in Maiduguri in 2002. Died in police custody in 2009. 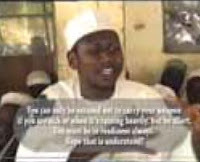 “Dear Muslim brothers, it is indeed a fact that we are the ones responsible for the act of war in the land called Plateau or Jos… The reason for this act is none other than that our creator has commanded us to war against any person that refuse to accept or acknowledge Islam after we have invited him to the faith.” – Boko Haram’s current leader, Muhammad Shekau. Share the message with your local church! Many Christians in Canada are simply unaware of the reality of persecution in the world today. Subscribe to our monthly newsletter and share it with a friend, encouraging them to sign up for their own free subscription. Consider using these summer months to plan and organize a prayer or letter writing group that can begin meeting regularly in the fall. Use VOM’s newsletter, prayer alert, and letter writing materials to guide you. Invite a speaker from VOM to share about persecution at your church. For our current events schedule or to request a speaker, contact our office or visit our online events calendar. Or you can share a story from The Persecution & Prayer Alert in your church bulletin, or show a video clip from VOM during the church service. You can watch or download a wide selection of engaging videos from our multimedia site. Put your creative skills to work! Follow our easy-to-use template to create parachutes used to drop Christian materials into guerrilla-controlled areas of Colombia. Work together as a church community to buy the fabric, assemble the materials, sew the parachutes, and cover the deployment cost of $5 per parachute. Click here for the parachute template. 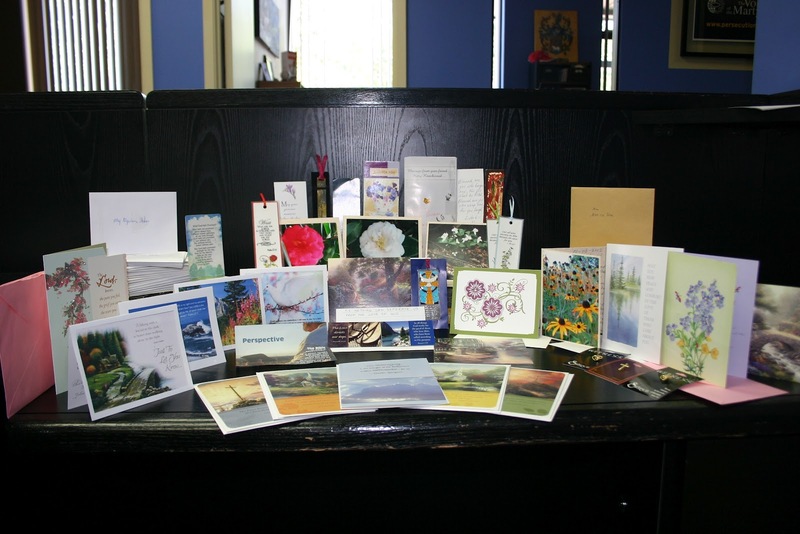 We are also looking for hand-made cards that can be used at VOM conferences for attendees to write encouraging notes to prisoners of faith. Get your kids, Sunday school class, or VBS involved and organize a card-making event with your church members. We will also gladly accept hand-made bookmarks. We would love to hear how you have shared the message of the persecuted Church with your own church community. Please contact our office or use the comment section below to share your ideas and feedback.